Training and a match lay in store on day one at the prestigious RCP polo club, a short walk from the hotel. After one or two cobwebs were blown away in the training session, the boys quickly got up to match speed against their opponents and fellow tourists, Perse School, running out 1-0 winners (Zach Allen with the goal). Day two not only held in store 3 matches, but also preparation for Maths IGCSE for some of the Vth form! 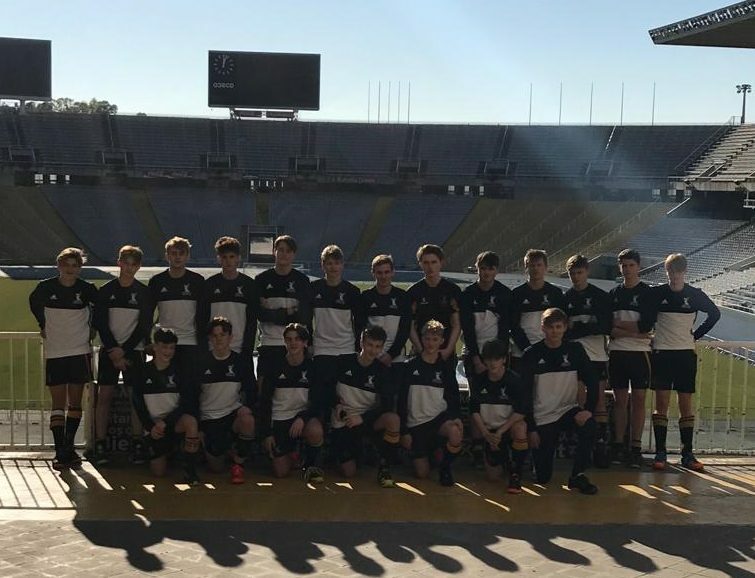 After breakfast and a revision session the squad was ready to go to the first venue, the Olympic stadium, to play FC Barcelona (a hockey team as well as a football team!). It was clear to see progress being made both in skills and tactics. Luke Cargan scored a sublime finish 15 yards from goal almost from the baseline and Seb Walton followed up soon after. The game ended 2-0, but on another day it could have been a lot more. In the break between matches we walked across the road to the iconic Barcelona Athletics stadium. We saw the spot where Linford Christie won a gold in the 100m and the boys heard all about the flaming arrow being fired through the sky to light the Olympic torch. Our second match was a rematch against Perse School and an opportunity to work on tactics such as man-marking, pressing and circle entry. George Bower-Nye scored an excellent back-foot shot moving away from goal, whilst James Stafford instinctively found his way into position to score the second. Perse stepped up their game and managed to find themselves with two well finished goals and the score ended 2 – 2. We returned to the hotel for a late lunch before heading out to the rolling green hills of the beautiful Athletic Terassa ground. We selected 4 different teams to play each of the four quarters. In the first quarter, with the older team, the boys held their own and went 1-0 up through another Luke Cargan finish, skilfully lobbing the keeper. Playing a predominately LVI and below team in the next two quarters, the boys were up against it. The Spanish side were physical and fast, but also had the usual Spanish quick hands. We competed well and learned a lot, conceding 2 goals in each quarter but it did give Tom Cunningham and Lewis Kelly some practice in goal. With all of the senior boys back on, the tables turned and we created lots of opportunities, held possession and dominated. Unfortunately, we just couldn’t find the back of the net and the score ended 0-0. With a lot of hockey in the legs, the boys had a recovery session in the morning, as we headed to the spa section of the hotel for some pool work. Ice baths were not compulsory, but most of the boys tried it out! Being in Barcelona, and only a 5 minute walk to the Camp Nou, we headed to the stadium tour for a look around. To see all of the magnificent trophies on display, as well as inspiring video clips, not to mention the huge stadium was an amazing experience for the team. Captain Luke Leman suggested we use the some of the core values and implement them in the ethos of the hockey team; Effort, Teamwork, Ambition, Respect and Humility. The final training session and match was at another spectacular ground, CD Terassa. The boys were in awe of the setting, with Josh Murphy particularly vocal at how amazing the backdrop of the mountain was. It was clear to see the improvement the boys had made in such a short space of time. A 3-2 win, and more practice for the U16 contingents in preparation for their National and County Cups when they return; Hugh Stanton, Freddie Hellicar, Zach Allen, Matthew Chee, George Lawler, Josh Barrott and Seb Walton. The older boys finished the match, again giving them practice for the competitions that lie ahead. Scorers were Seb Walton, who got 2, and Luke Cargan. Under 18 Hockey Tour to Barcelona was excellent and one to set the Ardingly boys on the right foot for the season. Thanks go to Mr Drayton-Charna for his umpiring, support and exceptional coaching.